Rooms still available for Army-Navy Weekend! 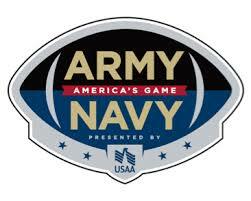 Philadelphia, once again, is the host of this year’s Army-Navy Game presented by USAA. The City of Brotherly Love is rich in history and tradition, and is proud to have hosted the Army-Navy Game 86 out of the last 117 games. This year’s showdown will take place at Lincoln Financial Field on December 9, 2017, at 3:00 p.m. marking the 11th time that Lincoln Financial Field has hosted this great rivalry. Army/Navy Weekend in Philadelphia, December 8 and 9, 2017, will be chock full of fantastic events. Besides the main event, America’s Game on Saturday, there will be a Pep Rally on Friday at noon at the Shops at Liberty Place featuring Academy Pep Bands and Cheerleaders. On Friday evening, the USAA Army-Navy Boxing Classic will take place at the Pennsylvania Convention Center featuring 7 bouts. The Patriot Games will also be taking place over this weekend. Presented by USAA, the Patriot Games is a spectacular two-day competition between the Cades and the Midshipmen. Points are entered through five events, including Rocky Relay, Leadership Reaction Course, Tug-of-War, Pull-Up Challenge. The final event will be the Stadium Obstacle Relay held in the Stadium before game time which will determine the winner of the Patriots Games trophy! Last, but not least, there will be an Operation Gratitude Game Day Collection. Toiletries, socks, knit hats, flash drives and other items to make care packages for our troops overseas will be collected at the entrances to Lincoln Financial Field on Game Day. The City of Philadelphia is proud to host Army-Navy Weekend, and A Bed and Breakfast Connection is pleased to offer Bed and Breakfast and private homestay accommodations for this busy weekend. We offer comfortable and affordable accommodations in Center City that are within walking distance to public transportation to the stadium. Often, families call us looking for multiple rooms for Army-Navy Weekend, so contact us soon while availability is still good! So far we have stayed in two of your B&Bs and each have been superb. Thank you for your service and helpfulness in our time crunch. "Thank you very much for all your help booking this B&B. The owners couldn't have been any nicer. It was a wonderful place to stay. I'll be sure to use your service again." "It was a nice stay and such a beautiful old building on a lovely street. You and your office were wonderful! Everything was easy to book. Thank you!" "Thank you so much. This was a great experience all around."